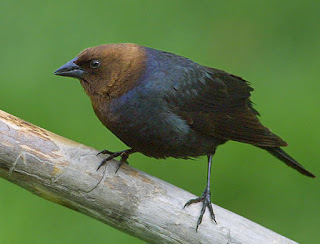 The brown-headed cowbird, seen in small noisy groups at this time, is a western bird named because of its former habit of following buffalo herds and gathering up insects from the clods of earth kicked up by the herd. Because of this feeding habit, the eggs are laid in the nests of other species as they go, leaving the unfortunate surrogate parents with a very large chick to feed and the demise of their own! Warblers are their favorite targets and this has contributed to the decline of woodland warblers in North America. 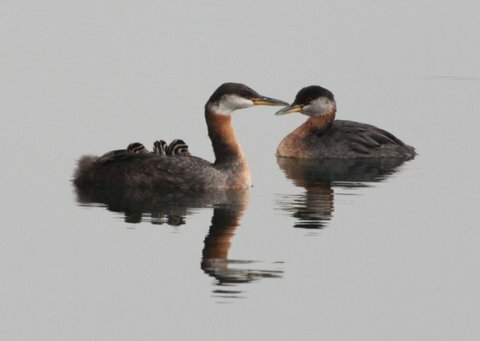 You can see pairs of red-necked grebes displaying and carrying on in the bays. Their courtship is noisy and rambunctious. Look for Kildeers on the sandy flats or near the water. They are ground nesters. Their eggs are well camouflaged and the nest is scanty. The bird will lead you away from the nest by pretending it has a damaged wing. You'll see this behaviour in the coming weeks. 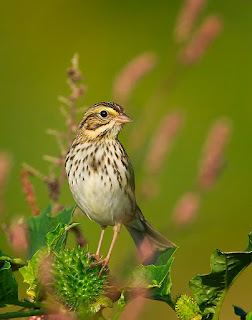 Savannah sparrows have just arrived. They are an elegant type of sparrow with strong yellow striping on the head. You can see and hear them establishing their territories on the outer grassed area closest to the lake. 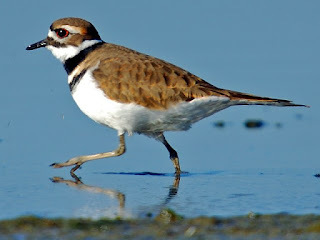 They nest on the ground under grass clumps or hidden up against rocks.